Soup is a delicious dish that can be served on almost any occasion. It's also versatile – it can be consumed as a light appetizer or as a nutrient-dense, main dish. Although many ingredients qualify as delicious additions to a soup, some of these ingredients are not good to include if you are following a cholesterol-lowering diet. Knowing which ingredients can add saturated fat, sugar, and calories to your soup can make the difference between a cholesterol-friendly dish and one that can adversely affect your cholesterol levels and heart health. Vegetables are necessary additions to any healthy soup. By including numerous types of vegetables, you are also including additional nutrients – and flavor. Adding veggies to your soup also adds healthy ingredients such as fiber and phytosterols to your diet, both of which can help lower your LDL cholesterol levels. Practically any vegetable can be used to add additional flavor and nutrients to your soup, whether it includes seasonal favorites such as pumpkin, zucchini, and corn, or ever-present veggies such as carrots, celery, peppers, and tomatoes. Meat substitutes – Instead of using meat, use a meat alternative. These foods are products that can add the texture of meat to your soup, without adding too many calories and fat. Tofu and soybean can make excellent alternatives to meat in your low-fat soup, adding additional protein for a filling, delicious meal. Use poultry instead of meat – Using lean cuts of poultry can also provide added protein to your soup, without adding as much fat as other cuts of meat. When selecting poultry, choose leaner cuts, such as chicken or turkey breast. Use fish instead of meat – Although not thought of as often as meat and poultry, fish can also be added to soups. Some fish, such as salmon and tuna, contain a good fat called omega-3 - which can actually help lower your triglycerides. Add beans – A filling food, beans are sometimes neglected in soups. Nonetheless, this heart-healthy ingredient is also packed with soluble fiber as well as protein and other nutrients. Garbanzo beans, kidney beans, northern beans…all of these beans – and more – can create a satisfying soup without adding fat. Leaner cuts of red meat – if your recipe calls for meat, and you really have a craving for it, opt for leaner cuts and consume in moderation. Additionally, you should inspect the meat before preparing it for your soup, and trim away any visible fat. Looking to add a little bulk to your soup? If so, select fiber-rich whole grains to add to your soup. Whole grains can add additional vitamins and fiber. The choices are endless and could include barley, whole-grain rice, quinoa, and wheatberry. However, you should limit your use of refined grains, which do not contain as much fiber as their whole-grain counterparts. Although your broth is the base for the soup, it can also contribute unwanted calories and fat. You have two options for your soup broth: using store-bought broths or making your own. If you chose to purchase broth at the store, make sure you check the food labels for calorie, sugar, and fat content. Ideally, all of these should be low. Additionally, check your sodium content. Although sodium does not affect your cholesterol levels, it could contribute to high blood pressure if you consume other meals high in salt, too. If you chose to make your own, there are many ways you can do this. Vegetable and chicken-based broths can be tasty additions to many soups – and not have added fat. 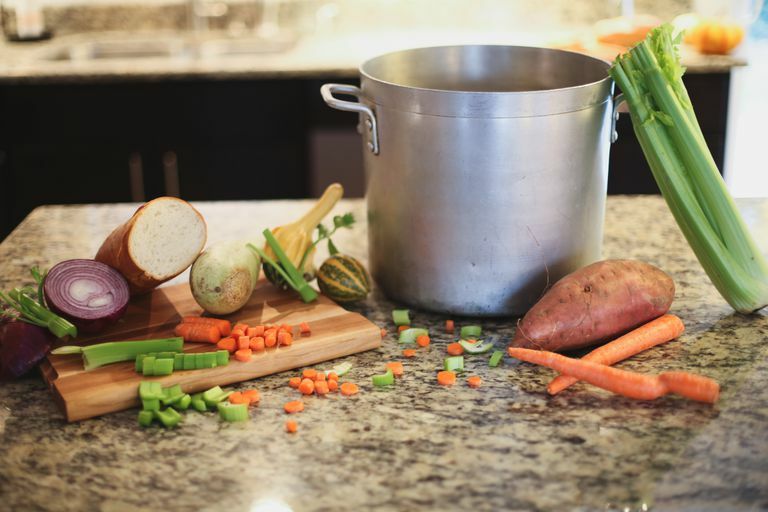 When preparing your own broths, make sure to skim off any excess fat. You could also make a meat-based broth that is diluted with more water, allowing other ingredients to provide additional flavor. Limit or completely eliminate butter and creams, which could increase the saturated fat content of the soup. Spices – Many forget the valuable contribution that spices can make a dish. Without adding many calories, spices can enhance the taste of many dishes. Turmeric, basil, rosemary, and ginger are just a few examples of spices that can liven up a boring soup. Looking to add a little heat? Stir in a little cayenne pepper or paprika. Remember, a little bit of spice can provide a lot of taste. Cheese – Often sprinkled on top, this tasty ingredient can add extra calories to your meal. If you want to add cheese, look for low-fat versions of your favorite cheeses. Crackers – These foods can add an additional crunch, as well as additional calories. If you love crumbled crackers in your soup, go for whole grain or high-fiber crackers. Additionally, having these crackers on the side – instead of in the soup – can ensure that you don’t go overboard on the calories. Incorporating certain whole grains into your soup, such as wheatberry or barley, can also add a chewier texture – and more fiber. Watching your fat intake doesn’t mean skimping on taste. As you can see, there are many options for creating the perfect soup that can taste great – and ease your cholesterol worries.